Den Gion resort is an ideal eco-resort with 7 ha in area. 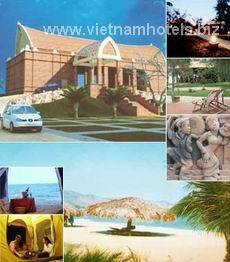 5 km eastern far from Phan Rang city, lying on charming and romantic beach. This area is one of the most beautiful beaches in Vietnam with a weeping willow forest lying along beautiful seashore. Den Gion resort is decorated in earthen red tones which are burned in fire. By using rock sculpturing art on terracotta material, our craftsman has brought a new breath of Bau Truc traditional pottery village to Den Gion resort to make a full-of-arts space. You will have opportunities to enjoy white sand, sea breeze and calming moment of your soul.